I love the holidays! Thanksgiving is special because you can spend time with the ones you love and be thankful for them! You save money by doing things in your own home with your children by doing these easy crafts. Paper crafts are a fun and peaceful kind of entertainment. Making crafts with your family is often more special than sitting around watching television. Creating something from scratch takes time, this is quality time that you can treasure. It’s simple. You don’t have to get an artist to create these crafts. A child could do it easily, so you are able to make these items just as easily as your kids. It's a good lesson for kids who are getting caught up in material things. They will have fun making these crafts and will get a glimpse of what the world used to be like without all of this technology (not that it is all bad though). This simple craft is so easy that anyone can do it! You can make it your own with different words, eye colors, and varying the shapes, etc. The best thing is to let your creative side run wild! If you don’t want to attach the turkey to the toilet paper roll using tape or glue, use a staple or two. It doesn’t look as good and it’s not as fun, but it holds much better in the long run. Out of colored construction paper, cut out the shapes of all the things you will need to make this turkey. This is as follows: Make feather shapes out of red, orange, yellow, and one brown one for his arm; make a black top hat for his head; cut a tiny yellow triangle for his nose; finally, cut a drop of red for his gobbler. Make his body and head out of brown. The body should be the same size as the toilet paper roll, and the small head should not be over the size of his body (or that may look funny!). Attach all of the items that you cut in step #1 to the spine and attached head of the turkey as shown in the picture. Glue the googly eyes to the face. Finally, cut tiny little feet for the turkey out of orange or yellow construction paper if you wish and attach them to the bottom of the turkey’s figure. Let your children sign the back of their art and add the year. Place it on the dinner table for the family to enjoy it for Thanksgiving dinner! 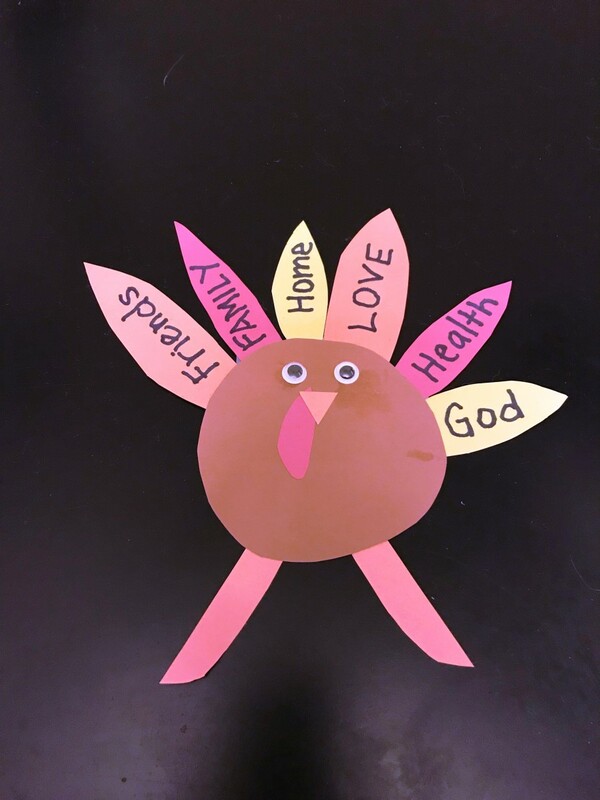 If you make several turkeys (or if there is more than one child who is participating), name each one a different name and create a team of turkeys to hang out with your family during the Thanksgiving holiday! Allow the child to get creative and write the things he or she is thankful for on the turkey’s feathers. Use real craft feathers for the back of the turkey. Suggest that the child make the feathers say the names of the guests at Thanksgiving this year. 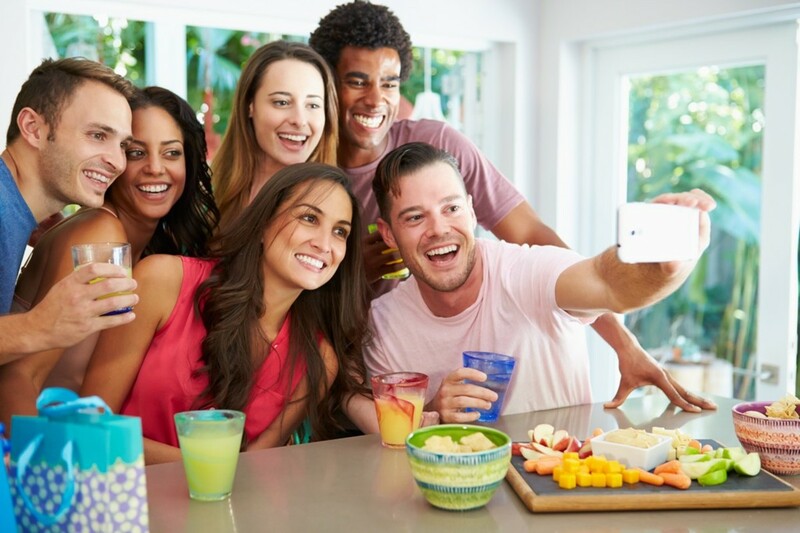 This could be fun and challenging if you have 10 or more people in your family or friends network at the table! 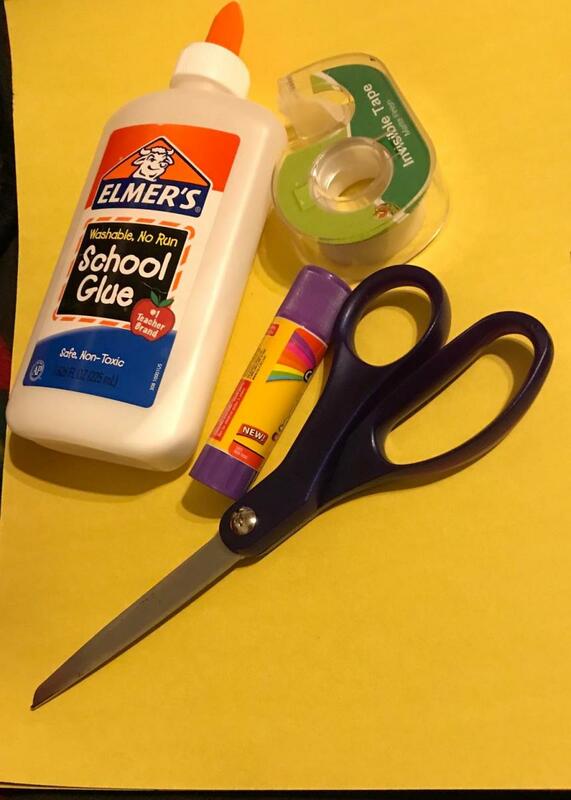 Draw clothes for the turkey or use scrapes of old fabric to make the clothes and attach them with Elmer’s glue. Use your and your child’s imagination and sense of adventure to make the crafts as special as you want them to be! It’s all about having fun and bonding in a good old fashioned way! These are fun to make with all of the choices in pie and the colors you can use. I love the whipped cream idea! I think that makes the pieces of pie look so much more real. I wouldn’t exactly get confused and eat one, but if I was delirious from hunger, I might be tempted! Lol. This crafts is made with as much creativity as you want it to have. Go with the flow and you’ll see it’s enjoyable to create! Just have a blast making it and it will just be your own design (or rather that of the child who made it). Out of paper plates, cut the pieces of pie. On top of each “paper plate piece of pie” glue down or double stick tape down little pieces of orange (or whatever color you are going to use for your pie) so that it looks like the pie (see the picture for better imagery). 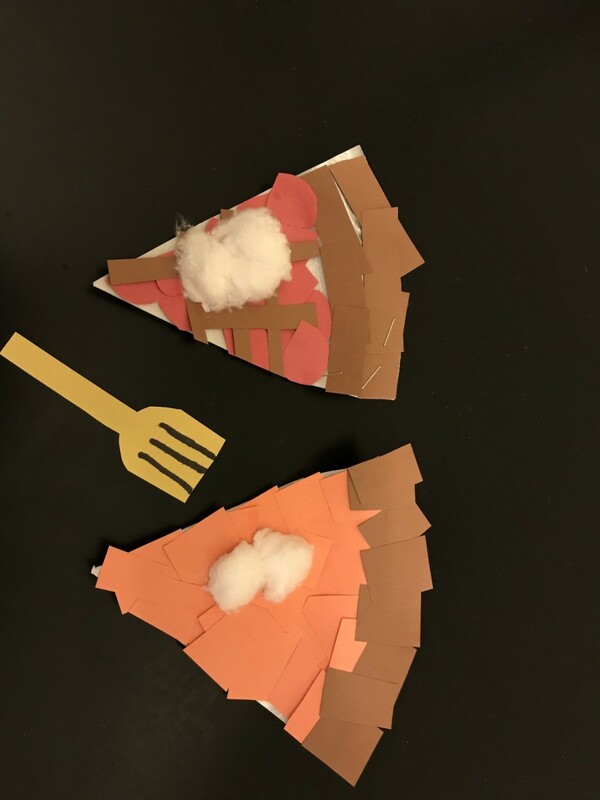 Cut a piece of a cotton ball in half and glue the two halves to the pie as it seems in the pictures where I have done this. As you attached the pieces of pie to the plate, do the same for the crust, only this time use solely brown, as it will appear to be the crust of the pie. I had to staple some of these down to have them stay better on the foam plate that I used. I would recommend paper rather than foam on this craft and it should stay together better. Cut out the size of a fork out of any color you wish, and using a sharpie marker draw the tongs so that it appears to be the utensil. Use other colors and pick different pies to make! Add black for chocolate on top! Skip putting some of the pie on it and add lipstick instead like someone took a bite out of the pie! Once you are done making the pieces of pie, put them with the real pies on the dessert table! See if anyone is fooled! Lol. Yummy! Just listing them makes my sweet tooth to wake up and get moving towards something sweet! 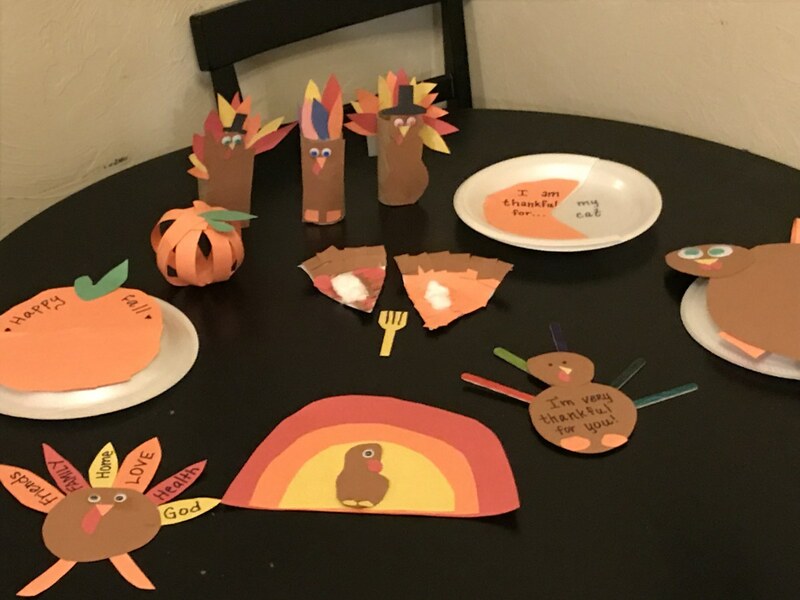 Cut out the feathers with red, orange, and yellow; cut out the body of the turkey with brown; cut out the nose with yellow or orange and the gobbler with red. Cut slim legs out of orange or brown. Attach the feathers to the brown body using tape or glue. Have the child write what he is thankful for on each feather. Attach the head of the turkey to the legs of the turkey with glue or tape. Using a glue stick attach the facial features to the face except the eyes; attach the eyes with Elmer’s glue. Give it to cooks so they can display them this thanksgiving on the dinner table. Just have fun and unleash your creative nature! Make the crafts your own way on this T-Day! 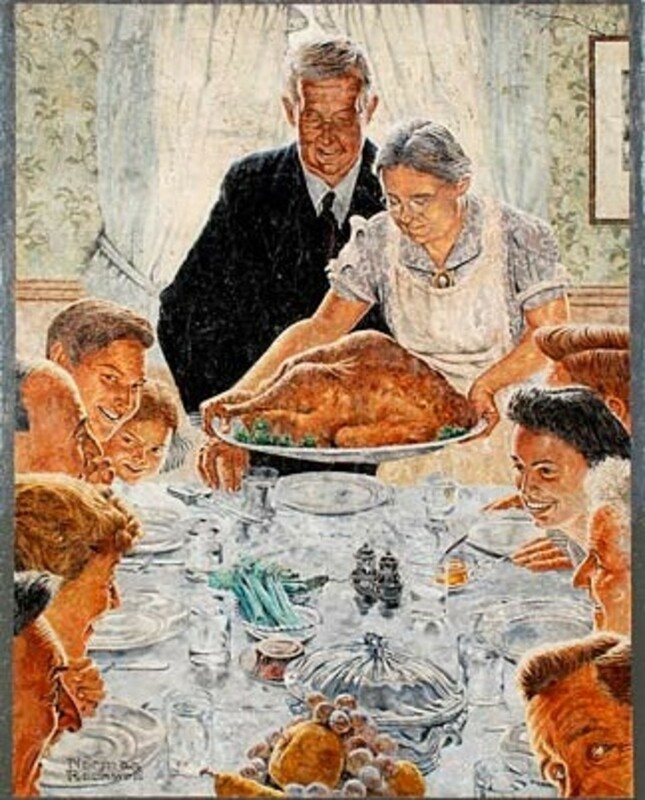 Suggest that the title make the feathers say the names of the guests at Thanksgiving this year. This could be fun and challenging if you have 10 or more people in your family or friends network at the table! Make the turkey a wild child with crazy colors or shapes. 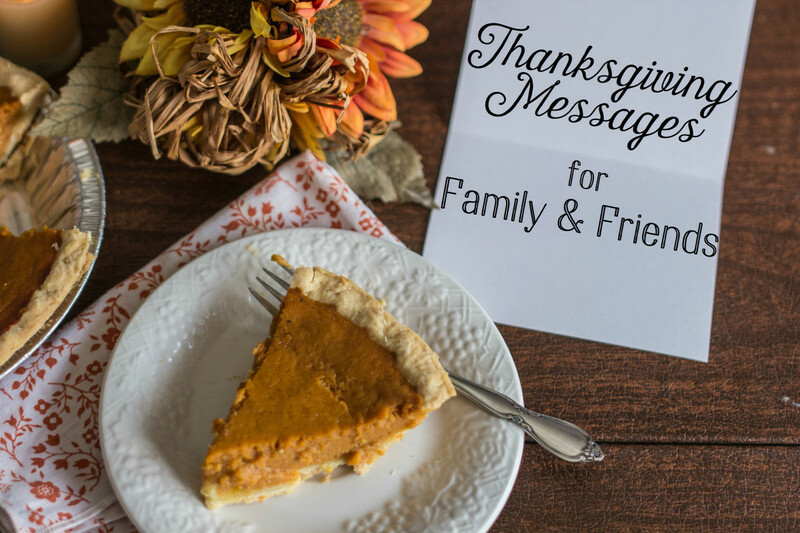 Draw or paste pictures of people, places, or things on the feathers rather than writing down what he or she is thankful for. Make a black top hat for the turkey. Draw eyebrows above the eyes of the turkey. Draw a big hillbilly mouth with teeth blacked out! Just bring out your goofy side and come up with fun stuff!! Which craft are you going to try to make this Thanksgiving? Thanksgiving is all about spending time with those you love. It’s about being thankful for the things you value in your life. It’s also a great time to do fun stuff with the kids (or even the adults) who share your t-day with you. 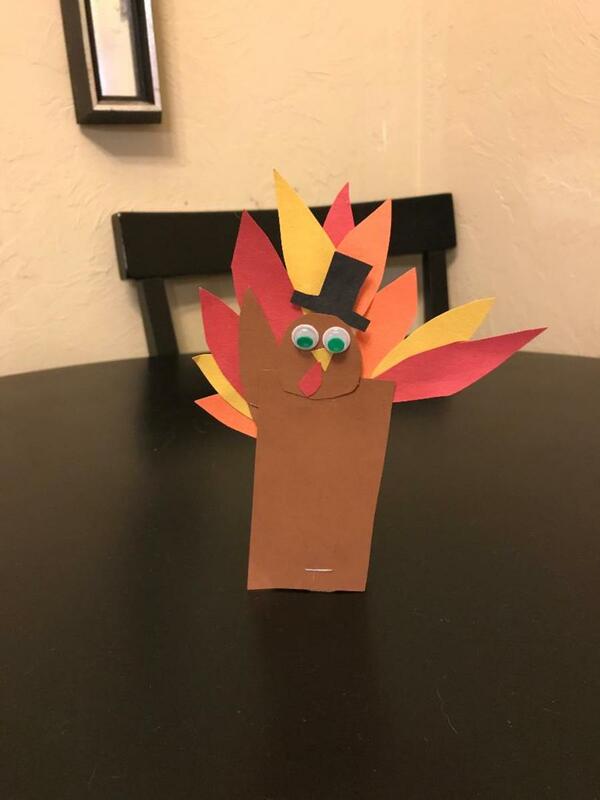 These simple crafts are very easy and affordable to make and even more enjoyable to play with once done or to just show off with the rest of the family (or whoever you are spending Thanksgiving with)! Thank you for the comment. I love coming up with crafts for kids and adults - old fashioned crafts with paper and lots of fun and creativity! I hope you enjoy making one of these with your loved ones this holiday season!